Background: Bacterial infection (BI) after congenital heart surgery (CHS) is associated with increased morbidity and is difficult to differentiate from systemic inflammatory response syndrome caused by cardiopulmonary bypass (CPB). Procalcitonin (PCT) has emerged as a reliable biomarker of BI in various populations. Aim: To determine the optimal PCT threshold to identify BI among children suspected of having infection following CPB. Setting and Design: Single-center retrospective observational study. Statistical Analysis: The Wilcoxon rank-sum test was used for nonparametric variables. The diagnostic performance of PCT was evaluated using a receiver operating characteristic (ROC) curve. Results: Ninety-eight patients were included. The median age was 2 months (25th and 75th interquartile of 0.1-7.5 months). Eleven patients were included in the BI group. The median PCT for the BI group (3.42 ng/mL, 25th and 75th interquartile of 2.34-5.67) was significantly higher than the median PCT for the noninfected group (0.8 ng/mL, 25th and 75th interquartile 0.38-3.39), P = 0.028. The PCT level that yielded the best compromise between the sensitivity (81.8%) and specificity (66.7%) was 2 ng/mL with an area under the ROC curve of 0.742. Conclusion: A PCT less than 2 ng/mL makes BI unlikely in children suspected of infection after CHS. Despite improvements in outcomes of congenital heart surgery (CHS), postoperative bacterial infections (BIs) remain common and cause morbidity.,,,, Prompt diagnosis is essential but BI is difficult to differentiate from systemic inflammatory response syndrome (SIRS) caused by cardiopulmonary bypass (CPB)., Procalcitonin (PCT) has emerged as a biomarker of BI.,, Studies have examined the kinetics of PCT following CHS.,,, Nonetheless, its utility in differentiating between BI and SIRS in patients suspected of having infection at various postoperative time points remains unclear.,,,, We aim to determine the optimal PCT level to distinguish between BI and SIRS in children suspected of having infection following CHS. Approval to conduct a retrospective review of patient information and health records was obtained from the institutional review board. The electronic medical records of all patients admitted to the congenital cardiovascular care unit (CCVCU) between January 2013 and April 2015 were reviewed. Patients between 0 and 21 years of age who underwent congenital cardiac surgery requiring CPB in whom PCT was drawn between postoperative days (PODs) 0-8 due to suspicion of infection were included. Evaluation for infection was performed at the discretion of the clinical staff in the CCVCU. 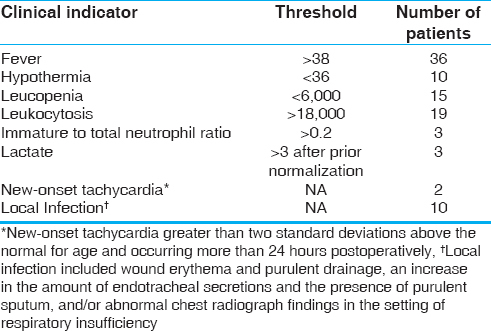 Clinical indicators that prompted the evaluation for infection are summarized in [Table 1]. PCT levels drawn on PODs 0 through 2 were considered to be in the early postoperative period, whereas the levels drawn on PODs 3 through 8 were considered to be in the late postoperative period. Patients with preoperative proven BI were excluded. Antibiotic prophylaxis was administered with 25 mg/kg of cefazolin within 1 h of skin incision, every 4 h during surgery, and every 8 h for the first 24 h after operation. Perioperative vancomycin prophylaxis was used in patients with known methicillin-resistant Staphylococcus aureus (MRSA) colonization and/or penicillin allergy. Patients who required delayed sternal closure were maintained on vancomycin and cefepime until 24 h after the sternum was closed. As per unit protocol, a blood sample was collected for PCT level, complete blood count with differential, C-reactive protein, and blood culture as soon as infection was clinically suspected. In addition, urine culture obtained by straight catheterization or indwelling catheter, respiratory viral panel by polymerase chain reaction, and chest x-ray were routinely obtained. Sputum culture was sent in all intubated patients via sterile endotracheal tube suction. Furthermore, the surgical wound was evaluated and culture was obtained if the wound infection seemed to be present. PCT, CRP, and cultures were not procured in patients where the infection was not clinically suspected. After collection, all blood samples were delivered to the laboratory within 30 min. A plasma sample was obtained. A two-step enzyme immunoassay sandwich method with a final fluorescent detection was used to obtain PCT levels (immunoluminometric assay, LUM test PCT; Brahms Diagnostic, Berlin, Germany). Patients were considered infected and therefore, included in the BI group if they met certain microbiological and clinical criteria. Patients were included in the infected group if they had a positive blood culture, a positive urine culture with greater than 105 colony forming units/mL, a positive sputum culture, along with white blood cells present on gram stain and/or consolidation on chest radiograph, and/or a positive wound culture. In addition, patients with clinical sepsis were included in the BI group despite the absence of positive cultures if certain criteria were met. Criteria for diagnosis of clinical sepsis were the presence of three or more clinical indicators of infection in the late postoperative period (PODs 3 through 8), which were not present in the early postoperative period (PODs 0 through 2) as well resolution of all indicators of infection with initiation of antibiotics and in the absence of other interventions. 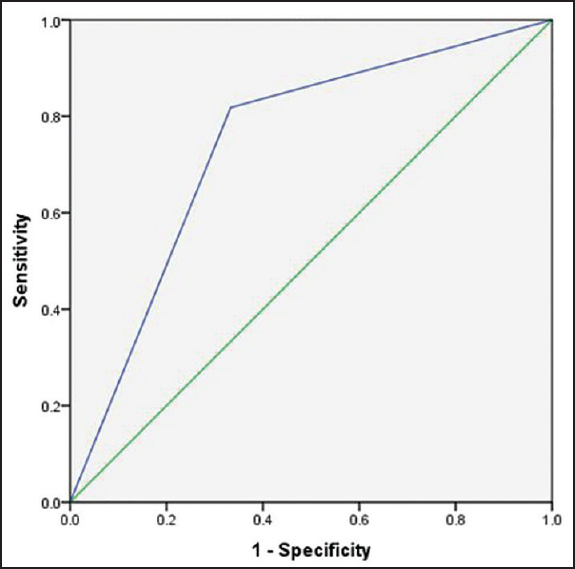 Prior to inclusion within the BI group, each case of suspected clinical sepsis was reviewed by two of the authors, and consensus was obtained in all cases. Variables distribution was analyzed by the Kolmogorov-Smirnov test. For variables with normal distribution, we reported mean and standard deviation. Variables without a normal distribution were expressed as median and ranges. Univariate analysis was performed to identify factors significantly linked to outcome. Normally distributed continuous variables were analyzed using the Student's t-test. The Fisher's exact test was used for binary variables, and the Wilcoxon rank-sum test was used for nonparametric variables. The diagnostic performance of PCT was evaluated using a receiver operating characteristic (ROC) curve. Data analysis was performed using Statistical Package for the Social Sciences (SPSS) software (SPSS version 22, Inc., Chicago, IL, USA). A value of P< 0.05 was used to determine significance. Four hundred and one patients of 0-21 years of age were admitted to the CCVCU during the study period. Of these, 98 patients met the inclusion criteria. Notably, there was no evaluation for infection initiated in the first 24 h after surgery, as the presence of the clinical indicators of infection during this time period was attributed to SIRS caused by CPB by the clinicians. [Table 1] lists the number of patients who had an evaluation for infection initiated for each of the clinical indicators. [Table 2] shows the clinical characteristics of the population. Forty-two patients were females. Seventy-three percent were 6 months of age and younger. There was no significant difference between the BI and noninfected groups with regard to age, weight, CPB time, or deep hypothermic circulatory arrest (DHCA) time. Operative procedures are shown in [Table 3]. There was no mortality in the study group. Eleven patients met the criteria for inclusion into the infected group. Eight had positive cultures including four tracheal aspirates, one urine, one blood, and one deep sternal wound. One patient had both positive urine and sputum cultures. Three patients met the criteria for clinical sepsis. The median PCT of the BI group (3.42 ng/mL, 25th and 75th interquartile of 2.34 to 5.67) was significantly higher than the median PCT of the noninfected group (0.8 ng/mL, 25th and 75th interquartile of 0.38-3.39), P = 0.028 [Table 2]. Overall, the PCT level that yielded the best compromise between the sensitivity and specificity was 2 ng/mL (sensitivity 81.8%, specificity 66.7%) with an area under the ROC curve of 0.742 [Figure 1]. For this PCT threshold level of 2 ng/mL, the negative predictive value was 96.7% with a positive predictive value of 23.7%. Twenty-six patients had sepsis evaluations initiated in the early postoperative period (POD 1 or 2). Of these, two patients (7.7%) met the criteria for inclusion into the BI group. Seventy-two patients had sepsis evaluations initiated in the late postoperative period, with nine patients (12.5%) included in the BI group. When the data from the early and late postoperative groups were analyzed separately, there was no significant difference in the medians for the infected (median 4.57 ng/mL, 25th and 75th interquartile of 3.47-5.67) and noninfected groups (median 2.12 ng/mL, 25th and 75th interquartile of 1.40-5.86) in the early postoperative period (P = 0.554). In contrast, there was a significant difference in medians between the infected (median 3.29 ng/mL, 25th and 75th interquartile of 1.47-5.68) and noninfected groups (median 0.64 ng/mL, 25th and 75th interquartile of 0.33-1.80) in the late postoperative period. In the late postoperative period, a PCT threshold of 2 ng/mL was once again the level that delivered the best compromise between sensitivity (77.8%) and specificity (76.2%) with an area under the ROC curve of 0.639. During this time period, a PCT level of 2 ng/mL had a negative predictive value of 96% and a positive predictive value of 31.8%. The primary aim of this study was to determine if PCT could be utilized to distinguish between patients with and without BI among children suspected to have infection after CHS. We found that in this patient population, PCT levels were higher in patients with BI as compared to those without infection. These findings were in accordance with those of several prior studies. Garcia et al. monitored the PCT levels in infants and children with systemic inflammatory response syndrome on POD 1-3 following CHS. Significant differences were detected in the PCT values of the BI group versus the non-BI group in the tests performed on POD 2 and POD 3. PCT values on POD 1 were higher in the BI group than in the non-BI group without a statistically significant difference. Similarly, McMaster et al. compared the median PCT on PODs 1-5 of patients with known infection to patients without fever or suspicion of infection after CHS. Median PCT levels were significantly higher in the sepsis and local infection groups as compared to the noninfected group. A limitation of both the prior studies was that the PCT levels were compared between patients with known BIs to those not suspected of having infection. In contrast, all patients in our study were suspected of having infection based on their clinical status. Among this subset of patients who were suspected of having infection, PCT levels were higher in the group confirmed to have BI. This is important because PCT is clinically useful only if it helps to distinguish BI from the absence of BI in patients in whom infection is clinically suspected. The secondary objective of this study was to determine if the utility of PCT varied in the early and late postoperative periods. Multiple studies have examined the kinetics of PCT in children following CHS. There is an increase in PCT postoperatively with a peak at 24-48 h with a return toward the baseline level by 72-96 h.,,, These findings are were similar to those reported in adults after cardiac surgery., For this reason, it has been hypothesized that the utility of PCT in distinguishing BI from SIRS may be decreased in the early postoperative period. The findings of the current study support this hypothesis. We found that when early and late postoperative time periods were analyzed separately, the median PCT levels were statistically significantly different in the BI and noninfected groups only during the late postoperative period. In contrast, in a study by Seguela et al. among children suspected of having infection after CHS, median PCT level was significantly higher in the infected group before POD 3 but on or after POD 3, there was no significant difference between the infected and noninfected groups. The authors report that the diagnostic value of PCT in the late postoperative period was improved by a second value obtained 24 h after the initial sample. We also sought to identify a threshold PCT value, which could be utilized to reliably differentiate between BI and noninfected patients. The data from prior reports are inconsistent. Arkader et al. described the kinetics of PCT in children after CHS and reported that no patient had a PCT level greater than 2 ng/mL in the early postoperative period. This study was limited by the older age of participants, low complexity of surgery, and small sample size. In contrast, other studies have shown that a subset of patients without BI will have a PCT level above 2 ng/mL even after POD 3., Consequently, proposed threshold levels for the identification of BI in prior studies have varied widely, from 0.38 ng/mL to 13 ng/mL, and several authors have suggested using different threshold values for different days or time periods.,,, In the current study, a PCT level of 2 ng/mL was found to be the optimal threshold value for discrimination of infection. Even at this threshold value, PCT is not highly sensitive or specific for infection. The negative predictive value, however, is high. Based on these data, we deduce that in pediatric patients suspected of having infection after CHS requiring CPB, the presence of a PCT level less than 2 ng/mL makes BI unlikely. Furthermore, we found that although there was a trend toward a higher PCT value in the BI group in the early postoperative period, this did not reach statistical significance. Therefore, we conclude that PCT is useful as a biomarker for infection primarily in the late postoperative period, specifically PODs 3 through 8. We speculate that these findings may allow clinicians to decrease antibiotic administration to this subset of patients. The limitations of this study include its retrospective and observational nature. In addition, the number of infected patients included was small. This was particularly relevant in the early postoperative time period, which may have confounded the findings. Among children who have undergone CHS requiring CPB and are suspected of having infection in the late postoperative period (PODs 3-8), a PCT level less than 2 ng/mL makes BI unlikely. Further studies are required to determine if utilization of this threshold value can lead to decreased antibiotic utilization while maintaining patient safety in this population. Grisaru-Soen G, Paret G, Yahav D, Boyko V, Lerner-Geva L. Nosocomial infections in pediatric cardiovascular surgery patients: A 4-year survey. Pediatr Crit Care Med 2009;10:202-6. Ma M, Gauvreau K, Allan CK, Mayer JE Jr, Jenkins KJ. Causes of death after congenital heart surgery. Ann Thorac Surg 2007;83:1438-45. Barker GM, O'Brien SM, Welke KF, Jacobs ML, Jacobs JP, Benjamin DK Jr, et al. Major infection after pediatric cardiac surgery: A risk estimation model. Ann Thorac Surg 2010;89:843-50. Wheeler DS, Jeffries HE, Zimmerman JJ, Wong HR, Carcillo JA. Sepsis in the pediatric cardiac intensive care unit. World J Pediatr Congenit Heart Surg 2011;2:393-9. Pasquali SK, He X, Jacobs ML, Hall M, Gaynor JW, Shah SS, et al. 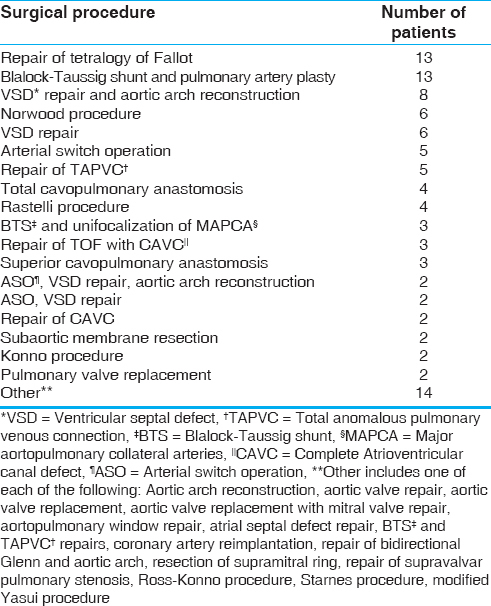 Hospital variation in postoperative infection and outcome after congenital heart surgery. Ann Thorac Surg 2013;96:657-63. Carlet J. Rapid diagnostic methods in the detection of sepsis. Infect Dis Clin North Am 1999;13:483-94, Xi. Maravić-Stojković V, Lausević-Vuk L, Jović M, Ranković A, Borzanović M, Marinković J. Procalcitonin-based therapeutic strategy to reduce antibiotic use in patients after cardiac surgery: A randomized controlled trial. Srp Arh Celok Lek 2011;139:736-42. Lee H. Procalcitonin as a biomarker of infectious diseases. Korean J Intern Med 2013;28:285-91. Agarwal S, Akbas N, Soundar EP, Gonzalez G, Devaraj S. Validation of the procalcitonin (PCT) assay: Experience in a pediatric hospital. Clin Biochem 2015;48:886-90. Park IH, Lee SH, Yu ST, Oh YK. Serum procalcitonin as a diagnostic marker of neonatal sepsis. Korean J Pediatr 2014;57:451-6. Arkader R, Troster EJ, Abellan DM, Lopes MR, Júnior RR, Carcillo JA, et al. Procalcitonin and C-reactive protein kinetics in postoperative pediatric cardiac surgical patients. J Cardiothorac Vasc Anesth 2004;18:160-5. Amin DN, Pruitt JC, Schuetz P. Influence of major cardiopulmonary surgery on serum levels of procalcitonin and other inflammatory makers. Anaesth Intensive Care 2012;40:760-6. Celebi S, Koner O, Menda F, Balci H, Hatemi A, Korkut K, et al. Procalcitonin kinetics in pediatric patients with systemic inflammatory response after open heart surgery. Intensive Care Med 2006;32:881-7. Michailk DE, Duncan BW, Mee RB, Worley S, Goldfarb J, Danziger-Isakov LA, et al. Quantitative analysis of procalcitonin after pediatric cardiothoracic surgery. Cardiol Young 2006;16:48-53. Minami E, Ito S, Sugiura T, Fujita Y, Sasano H, Sobue K. Markedly elevated procalcitonin in early postoperative period in pediatric open heart surgery: A prospective cohort study. J Intensive Care 2014;2:38. Séguéla PE, Joram N, Romefort B, Manteau C, Orsonneau JL, Branger B, et al. Procalcitonin as a marker of bacterial infection in children undergoing cardiac surgery with cardiopulmonary bypass. Cardiol Young 2011;21:392-9. McMaster P, Park DY, Shann F, Cochrane A, Morris K, Gray J, et al. Procalcitonin versus C-reactive protein and immature-to-total neutrophil ratio as markers of infection after cardiopulmonary bypass in children. Pediatr Crit Care Med 2009;10:217-21. Nahum E, Schiller O, Livni G, Bitan S, Ashkenazi S, Dagan O. Procalcitonin level as an aid for the diagnosis of bacterial infection following pediatric cardiac surgery. J Crit Care 2012;27:220.e11-6. Garcia IJ, Gargallo MB, Torné EE, Lasaosa FJ, Viñas AT, Tolosa CV, et al. Procalcitonin: A useful biomarker to discriminate infection after cardiopulmonary bypass in children. Pediatr Crit Care Med 2012;13:441-5. Dellinger RP, Levy MM, Rhodes A, Annane D, Gerlach H, Opal SM, et al. ; Surviving Sepsis Campaign Guidelines Committee including The Pediatric Subgroup. Surviving sepsis campaign: International guidelines for management of severe sepsis and septic shock, 2012. Intensive Care Med 2013;39:165-228. Arkader R, Troster EJ, Lopes MR, Júnior RR, Carcillo JA, Leone C, et al. Procalcitonin does discriminate between sepsis and systemic inflammatory response syndrome. Arch Dis Child 2006;91:117-20. Davidson J, Tong S, Hauck A, Lawson DS, da Cruz E, Kaufman J. Kinetics of procalcitonin and C-reactive protein and the relationship to postoperative infection in young infants undergoing cardiovascular surgery. Pediatr Res 2013;74:413-9. Prat C, Ricart P, Ruyra X, Domínguez J, Morillas J, Blanco S, et al. Serum concentrations of procalcitonin after cardiac surgery. J Card Surg 2008;23:627-32.